History has bequeathed us a colourful view of medieval times aided, in part, by influential studies such as Huizinga's ever popular The Waning of The Middle Ages. As a result, characters like Oswald von Wolkenstein catch our attention not only because their lives are so comparatively well documented but because they also chime with our expectations of the extremes of dramatic adventure and political machinations. After all, as knight and minnesinger, shipwrecked and imprisoned, diplomat and traveler, Oswald experienced a life more colourful than most of us enjoy even today, so the attraction is obvious. But what makes him particularly interesting is that he reflects these connections in his music, a diplomat and aristocrat who writes poetry in the troubadour/minnesinger tradition demands our attention on so many fronts. There are already several excellent recordings of Oswald's music notably by Sequentia, The New London Consort and, going further back in time, Studio der Frühen Musik to name but a few. 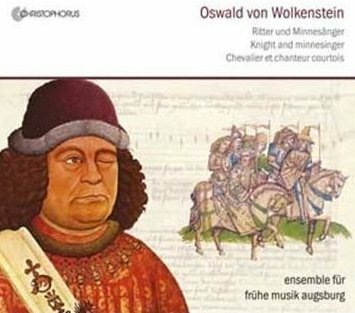 But the Ensemble für Frühe Musik Augsburg have, in this re-released album, taken Oswald's music and poetry (some of it explicitly autobiographical) and used it to tell the story of his life. It's an attractive and successful concept accompanied with notes, translations and a chronology for those who are interested in following the narrative behind the music. The performances are intimate and often delicate with the emphasis firmly on storytelling rather than formal concert-giving. It's a beguiling sound world and one in which their instrumental playing in particular has bags of personality, such as in 'Qui contre fortune' with its wonderful driving rhythms and reedy sounds. I particularly like the folksy voice of Sabine Lutzenberger who is at her best alongside some beautiful harp-playing in 'Der himel fürst uns heut bewar', and later in the ballade 'Je voy mon cuer'. In contrast to her voice there are some pretty rustic vocals from Rainer Herpichböhm that I found more challenging. This particular style of singing is quite prevalent in medieval music and, in my opinion, reflects more on our modern attitudes to folk traditions than it does to historically informed practice. However, with so little evidence on which to base performances of medieval repertoire it is a valid and useful style that may well serve some of this music far better than we realize; still I happen to find it difficult to listen to on a recording and would suggest that it is more apt to a live performance where eye contact and body-language fill the gaps left by such approximate tuning. These tuning issues are particularly noticeable with the countertenor's line in 'Herz prich', Oswald's interpretation of Italian trecento music which he presumably had direct experience of during his travels. Having said that, I did particularly enjoy Herpichböhm's singing in the opening autobiographical song 'Es fuegt sich' which Oswald wrote later in life, reflecting back on his times as page to a wandering knight. Further strophes from this work are to be found throughout the disc and it gives a structural framework to the first part of the programme. Also worthy of special note is the exquisite setting of 'Ave mater o Maria' used here to represent Oswald's death in 1445. I am surprised that this piece is not more prevalent in the early music 'canon' and I would hope that this recording does more to bring it to a wider attention. This is a particularly well-programmed album with good notes and lively communicative performances. The lack of English translations is slightly restrictive but this could easily be rectified when the English-language version of the ensemble's website is completed in the near future. So, in summary, this is a valuable contribution to our understanding of Oswald von Wolkenstein which is well worth having back in the catalogues and an enjoyable musical feast.